Lose yourself in the tranquil setting you long for . 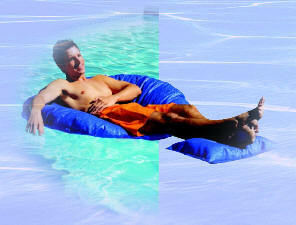 Whether lying down or sitting up, the light weight Seabiscuit awakens all of your senses and rejuvenates your spirit. With a versatile attached foot rest which doubles as a head rest - you will experience unbeatable comfort and deep relaxation. 54" x 54', 8lbs.